Mayor Sly James gave an ovation-rousing address to kickoff CityAge. 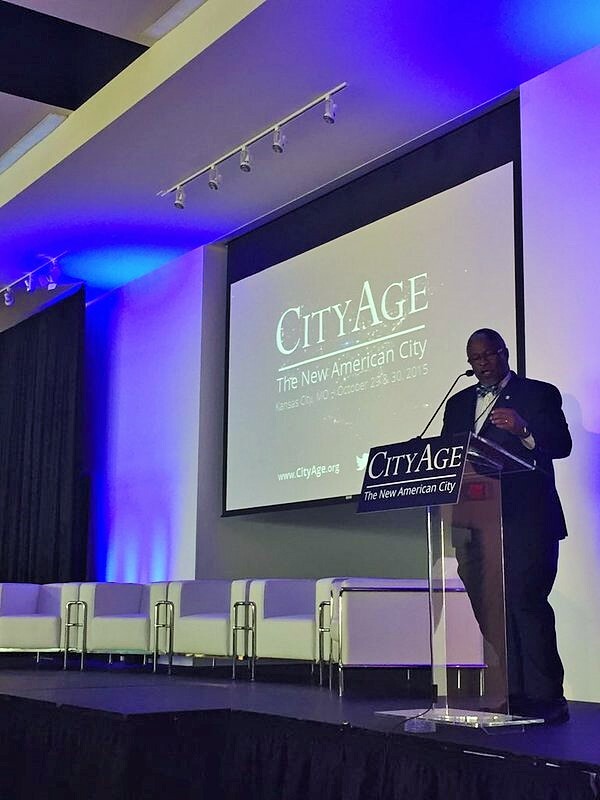 The CityAge conference on the “New American City” wound down its Kansas City gathering Friday morning. Throughout the two-day summit, one message in particular became increasingly clear, and it’s one that happens to form the basis of our Digital Playbook: a holistic approach across all disciplines is necessary in order for the cities to effectively leverage new technologies to help fix our existing problems. This fact was underscored on the first day when Mayor Sly James positioned the importance of gun control reform as an impediment to growth within the context of all the great things that have been occurring in KC lately – notably, a $30 million grant from the U.S. Department of Housing and Urban Development for ConnectHome, a $15 million investment by Cisco and Sprint into Smart and Connected City technology, Kansas City’s selection as an IEEE Core Smart City and a top 5 emerging entrepreneurial ecosystem. While all the technology in the universe can help make us more efficient, if we can’t sustain basic public safety, then these changes will not be as good as they could be. This need was further demonstrated on Friday when the Educated Cities panel analyzed the disparity between the current state of education affairs and what will be required of the cities of the future. Tacitly paying homage to the incessant competition between cities, the panel comprised Jim French (Senior Principal, DLR Group), Mike Stradinger (CEO, Holland 1916), Aaron North (Vice President, Education, The Kauffman Foundation), Daniel Frank (Deputy Director, Ready Nation), and was chaired by Mayor James. The speakers entered into a great conversation spanning several major topics: mandating pre-K to help macro-level growth of area schools, designing the schools of the future in order to foster “active learning,” altering the hiring criteria of teachers with the type of experience required by the New American City and challenging the status quo in order to compete. While we continue to move forward, these innovative solutions are more and more important. To use an apt (if you’re a fan of our World-Series champion Royals) sports metaphor, if your team is unable to win under the current model, the manager iterates, re-evaluates, and moves forward. This style of play is what has driven the Kauffman School to challenge the status quo, create schools for the modern student, and begin to create the talent pipeline that will be necessary to sustain the city of the future. In just a few short years, North explained, they were able to take students performing at the bottom of the state, and bring them in the top 94-98th percentiles. As we move forward, Kansas City will need to continue to focus on leveraging our unique strengths to our advantages in order to maximize our future potential. Guest blogger Bryan Wilson is a juris doctor candidate at the UMKC Law School and is a participant in the Code for KC Brigade and KC Legal Hackers.